Two-way radios (also known as walkie talkies) are a great way to stay connected in remote locations. Because they operate on radio frequencies, which are available everywhere, they are almost always usable; unlike cell phones, which require cellular signals that aren’t always accessible. Which one should you choose? Read through the following reviews. When you’ve decided on an option and you’re ready to make a purchase, click on the yellow link to find the best prices currently available on Amazon. 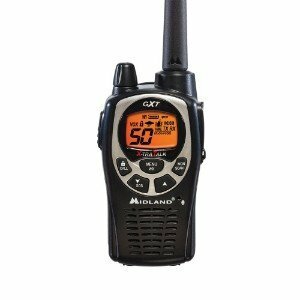 First up on our list of the best long-range two-way radios is the Midland – GXT1000VP4. With a range that can reach up to 36 miles, you’ll be able to stay connected over long distances in remote areas with ease. It boasts a ton of features too; plus, it’s easy to use and quite affordable. 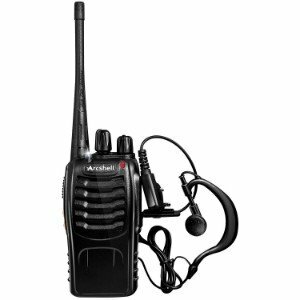 This long-range two-way radio offers 50 GMRS channels and a 142 CTCSS/DCS privacy codes for a total of 3,124 channel combinations. There’s also a scan feature that you can use to see which channels are active. With so many channel combinations and the scan feature, you’ll be able to enjoy discreet, uninterrupted communication. There are 10 available weather band channels, too, as well as a NOAA weather alert feature, which will sound an alarm to instantly notify you have any severe weather that may be coming your way, so it serves as a weather radio, too. Easy Voice and Sound Recognition (eVO) and an included two-way radio headset and earpiece let’s you enjoy hands-free communication. This device comes complete with a rechargeable battery pack, a belt clip, a 120 volt dual desktop charger, an AC and a DC adapter, as well as an easy to read owner’s manual. You can choose from several styles, too, including a three pack, a two pack, which is available in three different colors, including camo (perfect if you’re looking for a hunting two-way radio), and a single pack. Final Verdict: The Midland – GXT1000VP4 long-range two-way radio is feature-rich, durable, and easy to use, so you’ll have no trouble staying connected over long distances. 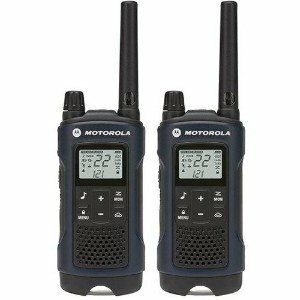 Whether you’re looking for a business two-way radio, a waterproof two-way radio, or you just want an easy to use handheld two-way radio that offers long-range communication, the Motorola 22-Channel Weatherproof 35 Mile Range Two Way Radio is a great choice. Since it’s made by Motorola, one of the best names in mobile communication, you can count on its durability and reliability. This device offers a range of up to 35 miles and operates on both FRS and GMRS channels. There are 22 channels and 121 privacy codes, giving you a total of 2,662 combinations to choose from. NOAA weather updates allow you to stay on top of the weather so you can make the proper preparations when impending storms are in the forecast. It can either be powered by an NiMH rechargeable battery (included), which holds its charge for up to 10 hours, or three AA batteries for up to 26 hours of power. IP54 weatherproof construction allows this device to withstand rain, snow, and splashes of water, so you can have peace of mind knowing that it won’t short out if it gets wet. This walkie talkie also acts as an emergency radio, as it sounds an alarm to alert others when you’re in need of help. There’s a built-in LED flashlight. And, because it’s compatible with any FRS/GMRS radio, you’ll be able to connect with anyone else using the same channel and privacy code. Final Verdict: The Motorola 22-Channel Weatherproof 35 Mile Range Two Way Radio is outfitted with a variety of handy features that allow for easy communication and will keep you safe when you’re out in remote locations. Whether you want to stay in touch with your hunting buddies or you need to stay connected to a work crew, Arcshell’s Rechargeable Long Range Two-Way Radios are a fantastic choice. It comes with four durable, feature-rich devices. While the available range (up to 5 miles) isn’t as expansive as other walkie talkies on our list, it’s still more than standard two-way radios. Each walkie talkie weights just 6.3 ounces and measures 4.53 inches (not including the antenna), so whether you’re hunting or on the job, it won’t weigh you down. Durable and water-resistant, these long range walkie talkies will stand up to all types of conditions. All four devices are pre-programmed with 16 channels, and all channels and devices have the same frequency, which means you can easily stay connected with your team. These two-way radios are powered by 1500mAh rechargeable lithium ion batteries. When the power is running low, just pop them on the included charging dock and they’ll be charged back up to full power in about 2.5 hours; once fully charged, they have a runtime of 96 hour run time. They come with headsets and earpieces, so you can enjoy hands-free communication, and the mics and speakers offer crystal clear communication. Final Verdict: The Archsell Rechargeable Long Range Two-Way Radios are a great choice if you need to stay connected with a group of people. It comes with four walkie talkies that have a range of up to 5 miles. All devices are durable and feature-rich for reliable connectivity in remote locations. If you’re looking for a super affordable set of long-range two-way radios, Ansoko’s Long Range Walkie Talkies are a good choice. You’ll receive four 2 watt programmable handheld radios, which makes this a great choice for groups that need reliable communication devices in remote areas. With a 400 to 470 MHz frequency and a range of up to 3 miles, you’ll be able to stay connected when you’re hunting, hiking, or on the job site with ease. Thiese devices are outfitted with voice recognicition technology and come with earpieces too, so you can enjoy hands-free communication. 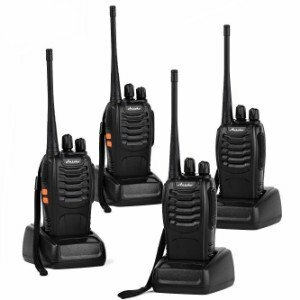 Each walkie talkie is outfitted with 16 channel memory, and they have 50 built-in CTCSS tones and 105 DCS codes. They’re made of super durable materials, lightweight, and offer crystal clear reception. With built-in LED flashlights, you’ll be able to see when the lighting conditions are poor. Plus, the batteries last for up to 24 hours, too. We also love that this pack comes with a 30 day free return policy and an 18 month warranty. Final Verdict: Overall, we were impressed by the Ansoko Long Range Walkie Talkies. For the price, you’ll receive four durable long-range two-way radios that offer all of the essential features that will make communication in remote areas a breeze. Last, but certainly not least, on our list of the best long-range two-way radios is the Retevis RT21 Two Way Radio. 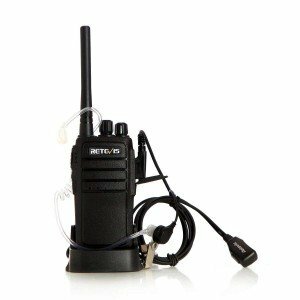 It really stands apart from the crowd because it comes with a total of 10 long range walkie talkies, making this a great option for large work crews or hunting teams. These walkie talkies are made of rugged materials and offer all of the essential features – plus a few bonus ones – which will make it easy to communicate when you’re in remote areas. The technology on these two-way radios offers deep penetration and clear reception, so whether you’re using them in a building or outside, you’ll be able to talk and listen with ease. An anti-interference and private team conversation let you keep your conversations private, and a scrambler feature blocks out the chatter from other conversations. This pack comes with “secret service” ear tubes, which further heighten clarity. A low battery alarm lets you know when you need to charge up; and when it is time to charge, just set them on the charging dock, which is included. Other notable features on this device include a busy channel lock out, scanning, an emergency alarm, a battery saver function, and English and Chinese voice prompts. Final Verdict: With the Retevis RT21 Two Way Radio, you’ll receive 10 high quality, rugged, feature-rich walkie talkies. Their lightweight, easy to use, and allow for easy, hands-free communication. Long-range two-way radios are walkie talkies that are designed to offer longer range connectivity. In other words, they provide better transmission and reception over greater distances than standard two-way radios. However, it’s important to note that while these devices “can” connect over longer distances, that doesn’t mean that they always do. In order to achieve the long range, you usually have to use them in unobstructed areas, such as open fields; so, if you’re in a building or in a heavily wooded area, the devices may not get the long range connectivity that’s advertised. Generally, most long-range two-way radios can connect and transmit within a 3 mile range, on average; if they say “up to 35 miles”, that means that they “can” connected at such a distance, but the area has to be unobstructed. Nevertheless, a 3 mile range is much longer than the range that a standard walkie talkie offers. With that said, long-range two-way radios are great tools for communicating over relatively longer distances in remote locations. Hunters, work crews, hikers, and bikers can benefit from these handy tools. Remember that the long range connectivity that these devices advertise typically mean that they can only stay connected in unobstructed areas; regardless, it’s important to consider the range so you know the approximate distances that the walkie talkies can transmit and receive signals. The more channels and privacy codes, the more private your conversations will be. NOAA weather channels and alerts. If you’re going to be using your walkie talkies outdoors, access to NOAA weather channels and alerts will keep you updated on the weather so you can make any necessary accommodations when severe weather rolls in. Voice Recognition. Also known as VOX, hands-free communication simplifies the use and your safety, as you can use can send and receive transmissions without your hands; in other words, you’ll be able to focus on the task at hand because you won’t have to fumble with your device. Battery life. The battery life is important, too. Obviously, you want your two-way radio to hold its charge as long as possible. A compact, lightweight walkie talkie won’t weigh you down and is easier to transport. By considering these factors, you’ll be able to select the best two-way radio with long range connectivity for your specific needs. Long-range two-way radios allow you to stay in touch in remote locations over greater distances. They’re great tools for hunting, hiking, biking, and even on jobsites; in other words, if you need to stay connected in an area that has limited cell reception over a distance of several miles, a long-range walkie talkie is a worthwhile investment.